Teams has become our go-to communication and meeting hub - to the point where we don't even have to send internal emails anymore! One thing that's great about Teams (besides combining chat, video conferencing, and file sharing in one easy to use application) is that Microsoft keeps adding new features and improvements every month. Teams meetings just got even better. 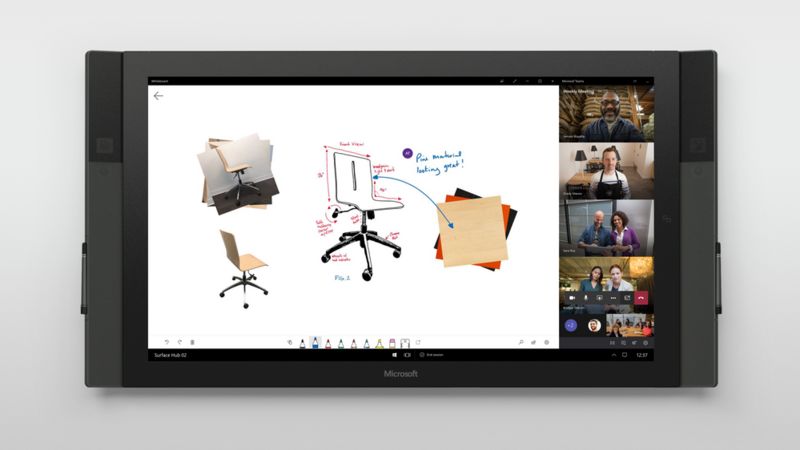 Use the Microsoft Whiteboard during Teams meetings wherever you are. You can start a new board in the Teams meeting (currently supported on desktop, web and Surface Hub – coming soon to mobile) and the board is automatically shared with meeting attendees. Users can also collaborate in real time on the board. To get all of the latest Whiteboard features, including gridlines, images, and sticky notes, download the latest version of Whiteboard app from the Microsoft Store (requires User sign-in). Host a live event in Teams. Now generally available is the "live event" option in Teams. Anyone can create live and on-demand events to reach audiences up to 10,000 attendees. Schedule, produce, broadcast and record streaming content all inside of the Teams app. Viewers can join live or watch on-demand from anywhere and across any device. Once this feature catches on, it should give platforms like Facebook live some competition. Teams now has "dark mode." A few weeks ago, Teams went live with dark mode and it looks great on mobile devices. You can change your viewing experience and enable the dark theme enable in the general section of the app settings. Respond to conversations and chats with a voice message. Both private chat and channel conversations allow you to communicate using recorded voice messages. Here are the instructions from Microsoft on how to do it: "From your mobile device, open a conversation, tap and hold the mic in the bottom right corner of your screen and start recording. Record up to 15 minutes, then tap Send to deliver your audio message." Teams has over 250+ integrations built by Microsoft, partners, or private developers. 1. Highlight the apps that are most important to their end users. 2. Choose which apps to pin and set the order that they appear in the app bar. 3. Set app and integrations policies for the org. 4. Manage how built-in features appear inside of Teams. 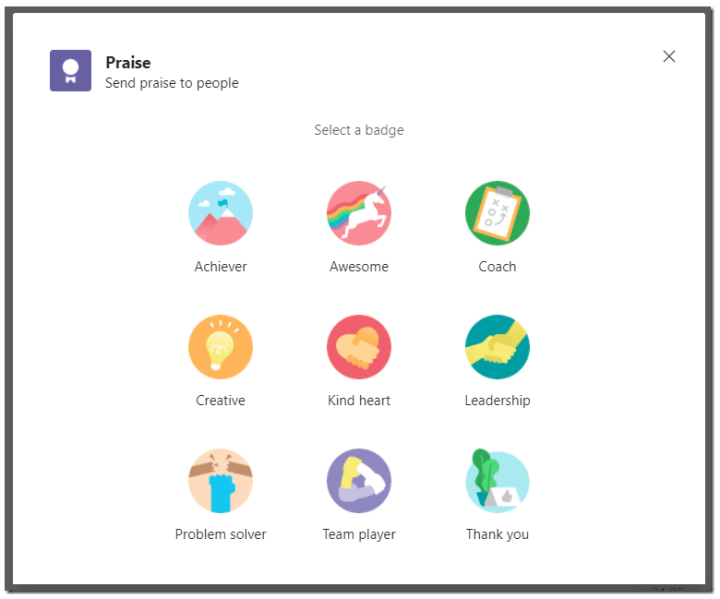 Praise message badges can be sent to colleagues in chat or assigned to specific teams/channels. Current badges include "Achiever," "Coach," "Awesome," "Leadership," "Problem-solver," "Team Player," and several more. When you give someone a badge in a channel, you are identified as the sender along with their name is displayed beside the badge for everyone to see. There is also the option of adding a personal note. To start sending praise, Select *** below the compose box, then select Praise at the top. When you send it, the receiver will get @mentioned, so they don't miss it. You've probably heard about Teams supporting shift workers with the shift app. This helps managers with scheduling and allows employees to keep track of their shifts, request time off, swap or offer their shift, and check off tasks all inside of Teams. There are also special HIPAA compliant features for Healthcare orgs using Teams. Developers can get templates from Microsoft for customizing Teams for Retail, Healthcare, and First-Line workers, but PTG can also customize Teams for your legal practice, non-profit org, manufacturing company, or any other work-specific needs you have. Contact us to learn more about Teams training or app customizations for your business or organization.